What’s the Bournemouth Air Show got to do with locks I hear you say? Well apart from taking place in sunny Bournemouth and the shop seemingly under the flight path a great deal. It seems that every time the skies thundered with some flying relic from WWII the phone rang or customers need attention! I particularly wanted a picture of a Lancaster bomber or Spitfire to show you but it wasn’t to be, perhaps tomorrow or Saturday… In the meantime this is from the Bournemouth Air Festival website. It’s not generally known that the first locks that Ingersoll made were in fact WWII aircraft locks – not key operated devices but secure devices to hold bombs in place until released or the locks that held the glider tow rope in place or even the locks that held Spitfire cannons in place. 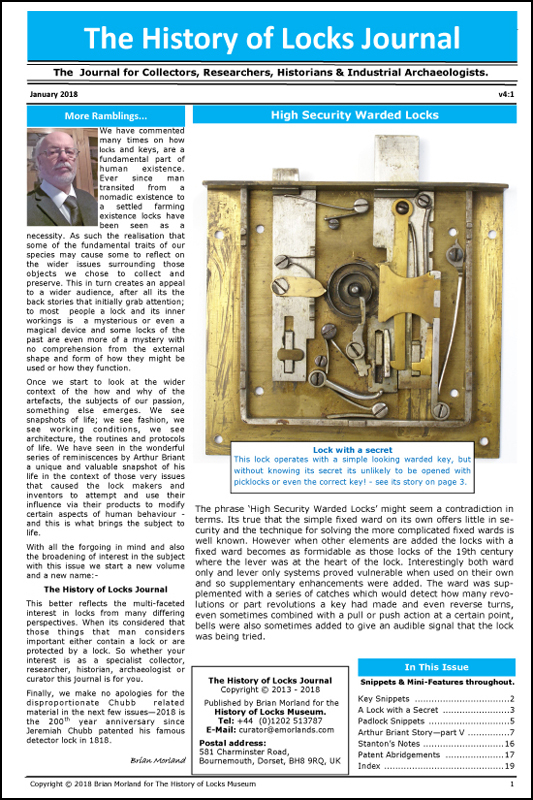 Of course after the war the demand was considerably reduced and so Ingersoll’s chief designer Jack Taylor patented the now familiar 10 lever security lock. Attached is a page from the Ingersoll catalogue for aircraft locks, but so far we haven’t managed to find an example for the collection. We live in hopes …. If there is interest I could post the whole catalouge. Very informative Brian, thank you! When I was younger I only knew Ingersoll as a watchmaker. Five years ago someone told me about Ingersoll locks and at first I thought that the watchmaker would also produce locks. I do not think that the watchmaker has anything to do with the lock maker but I have no information on that. It would be interesting to know more about that. A bit more success today. What a thrill, a very satisfying thunderous roar. The Lancaster bomber iconic in many ways - but for us its the very start of the Ingersoll lock story. Can you tell the pilot to make a tour to Frankfurt and pick me up ? Do you know the patent number of Jack Taylors 10 lever security lock invention? Did he invent other locks as well? I asked him but he said that he only did deliveries in Germany and not collections. Ingersoll watches of America, who also had a fairly large operation in the UK, went into liquidation in the early years of the 20th century. The directors bought the UK Company from the liquidators. With the approaching WWII hostilities a separate company was formed, Ingersoll Engineering Ltd. and expanded into light engineering. This was a tactical move to preserve the workforce from callup and demonstrates great foresight by management. Both companies operated out of the same premises. Jack Taylor who was already head designer at Yale with a string of patents to his name was ordered by MAP (Ministry of Aircraft Production) to Ingersoll to design a reliable locking payload release mechanism. Bombs rolling around inside the aircraft in flight were a problem and most undesirable! And ingersol rand were connected? No Tom, nothing to do with the mining Ingersoll. Although much later Ingersoll Locks was owned by The Gold Fields Group. I think that's where confusion arises sometimes.